Question 1. Explain how animals dwelling in the forest help it grow and regenerate. Answer 1 Animals work as the cleaning agents in the forest. Microorganisms convert dead plants and animals into humus which is rich in nutrients. 2) Animals help in dispersal of seeds from one part of the forest to other part. 3) Herbivores helps the carnivores to grow as they serve as food for them. 4) Animals excreta and their dead bodies when decomposed into soil act as manures for soil. Question 2. Explain how forests prevent floods. Answer 2 Forests act as natural absorber of rainwater and allows it to seep. The roots of the trees absorb the water and prevent it from flowing away. Roots of trees also help in percolation of water into the soil. This helps in preventing floods. Question 3. What are decomposers? Name any two of them. What do they do in the forest? Answer 3 Decomposers are the micro-organism which convert the dead plants and animals to humus are called decomposers. They clean the forests decaying dead bodies and replenishing the nutrients back to the forest soil.Decomposers recycle and convert dead matter into humus which mixes with soil and provide nutrients to plants. Question 4. 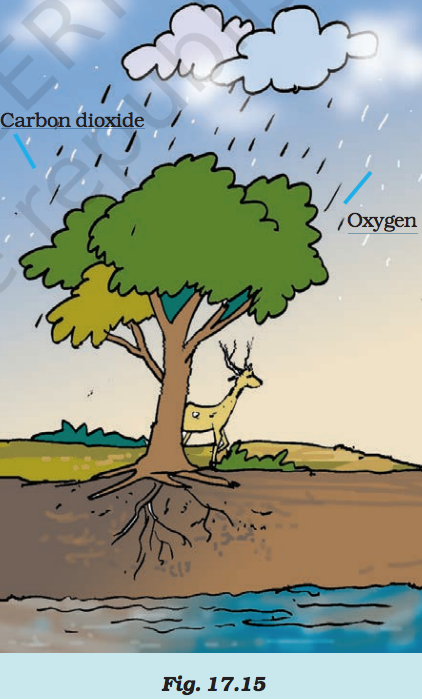 Explain the role of forest in maintaining the balance between oxygen and carbon dioxide in the atmosphere. Answer 4 Forest works like a self-sustaining system.Plants release oxygen in the atmosphere during the process of photosynthesis. This oxygen is inhaled by the animals for respiration. During respiration, they release carbon-dioxide which is absorbed by plants. In this way the oxygen and carbon dioxide cycle goes on. Since forests contain a large number of plants, they help much in this cycle and maintain balance in nature. Question 5. Explain why there is no waste in a forest. Answer 5 When the animals die in a forest, they are eaten up by some other animals. The decomposer organisms (bacteria and fungi) decompose the dead plant material, dead animals and animal wastes present in the forest into mineral salts (in the form of humus), water and carbon dioxide, which go into soil and air (and hence recycled for the growth of plants).Since dead animals are eaten up, and the materials present in dead plants, dead animals and animal wastes are recycled, therefore, there is no waste left in a forest. Question 6. List five products we get from forests? 5) Food for animals from forests. (a) The insects, butterflies, honeybees and birds help flowering plants in_________. (b) A forest is a purifier ______ of _______ and . (d) The decaying leaves and animal droppings in a forest enrich the __________. Question 8. Why should we worry about the conditions and issues related to forests far from us? 1) If there are no forests, there would be more floods and more soil erosion. 2) Reduced forest cover in a particular area leads to global warming which affects the whole earth. 3) Deforestation will endanger our life and environment. 4) In the absence of trees and plants, the animals will not get food and shelter. 5) Forests provide us large number of useful products including wood, fruits and medicines. Question 9. Explain why there is a need of variety of animals and plants in a forest. Answer 9 Different animals and plants play different role in the system of a forest. 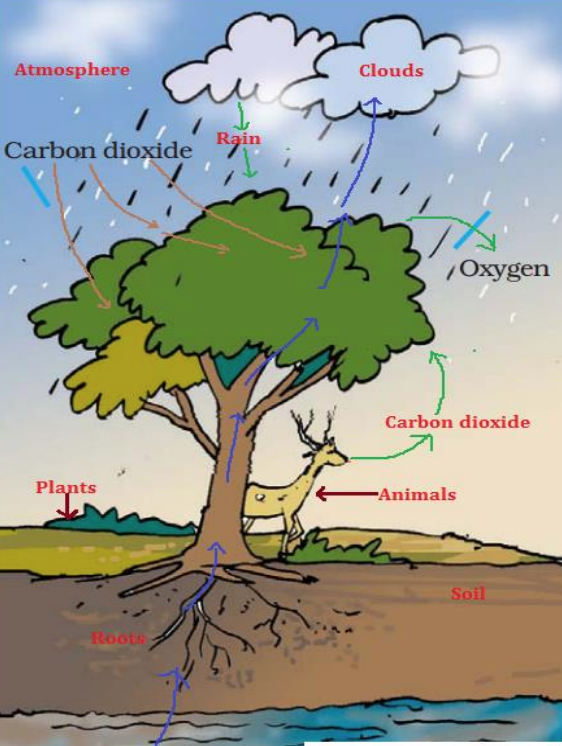 All plants and animals sustain the forest life and also carbon dioxide and oxygen cycle goes on due to them. Herbivores are needed to eat green plants and to provide food for the carnivores. Similarly, carnivores are needed to eat the herbivores and check their population.If there is no grass, all herbivores would die. If there are no carnivores, all herbivores would eat up all the plants and there is shortage of food. If there are no decomposers, the dead remains of plants and animals would pollute the environment. All food chains and food webs need variety of plants and animals. Question 10. In Fig. 17.15, the artist has forgotten to put the labels and directions on the arrows. Mark the directions on the arrows and label the diagram using the following labels: clouds, rain, atmosphere, carbon dioxide, oxygen, plants, animals, soil, roots, water table. Question 11. Which of the following is not a forest product? Question 12. Which of the following statements is not correct? Answer 12 (ii) Plants and animals in a forest are not dependent on one another.